The “Set You Back” geometry ? Some bike fitters base their geometries on the philosophy of a more setback position being beneficial for high performance road bike. For this article’s purpose, we will call these fitters “Set You Back Fitter". “Set You Back Fitter"'s in this article only refers to a general group of fitters who like to use excessive setback philosophy, and is in no way referring to anyone specific nor all bike fitters. Custom geometries that are based on this philosophy have a few issues with it. Why we disagree with this position. To achieve a certain position on the bike, compromises have to be made and in this case, the compromises made might affect the safety of the bike. The geometry tends to put the rider further back on the bike, whilst keeping the cockpit distance the same. A shallower seat tube angle is incorporated, as is a shorter stem to achieve this. This presents a few issues. As the rider is further back on the bike, the centre of mass of the rider is now on the back half of the bike. As the weight on the front is less, traction on the front wheel is diminished, and the rider might lose the front end while cornering @ high speed, resulting in a crash. A longer chainstay may be incorporated to compensate for this, however, this creates a bike that has a touring rear end with a racing front end which leads to under steer. The front end is willing to turn, but the rear end isn't. It is like marrying a Moto GP front end into a Harley Davidson rear end! 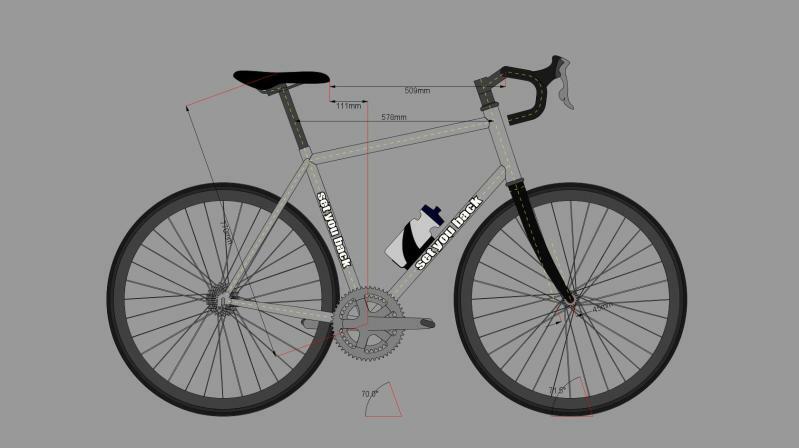 They may put a touring front end to match & the frame geometry will become 100% Courser !!! When riding in an upright position & sitting further back on the bicycle, you may get the false impression that the pressure on your hand is reduced leading to a more comfortable ride. The fact is that when in an upright & set back position you transfer all your weight to your spine. It may cause permanent damage to your back. Proper riding skill is about changing the load ratio between upper & lower body according the riding condition. This position encourages a rider to ride at a low cadence. Pedaling with very low cadence is similar to driving a car in 5th gear all the time. It is the main cause of many chronic health issues including an unstable pelvis, swollen patella, numbness, pains, injuries, heart disease & chronic fatigue. Ideally, you want to be positioned in the middle between the front & rear wheels for the most comfort. The up & down motion from the wheels have the least effect at that position, therefore there is less shock. As the positioning of the saddle is already offset from centre (much closer to rear wheel than front), any sort of movement backwards, ie setback, will only create more 'up & down movement' on you, making the bike feel more uncomfortable than it should be. The shorter stem puts the handling closer to the fork steerer, therefore any movement of the handlebars will have an enlarged effect on the steering, giving the bike a more twitchy feel. Which is an lethal cocktail with unweighted front end in high speed. This further back position does increase the power output @ low cadence on the bike. In this position, the rider essentially uses the whole body, including a lot of the upper body to pull the handlebar whilst pedaling. The overall power output on the bike increases by a few % but at a cost of doubling the metabolic cost, as it is a lot more fatiguing and hence is very difficult to keep it up over a long ride. Therefore after an ‘over one hour’ ride, a rider will feel a lot more fatigued in this position as opposed to a neutral position. *Also with a further back position you focus your energy on your gluteus muscles (bum) groups with slow twitch fibres, limiting the cadence achievable without moving forward. Optimal cadence cannot be achieved. It also increase the size of the dead zone either side of top and bottom dead centre substantially. The torsional rigidity of the frame is decreased due to the longer head tube that is utilized to increase height of the stem & handlebars. This can be easily resolved on a normal length headtube by using headset spacers, and/or different angled stem. Essentially, your whole body becomes more upright in the setback position. To compensate for sitting further back, the stem is shortened and the handlebar set up moves upwards. This basically rotates your body towards the vertical from your hips. As a result, there is greater surface area that head wind acts on you (drag force) and you become less aerodynamic (much like a parachute). To become more aerodynamic, rider must rotate themselves further down (towards the horizontal). In a setback position, this becomes more of a crouching motion as opposed to a straight rotation. The whole of the front of the torso is compressed, including the diaphragm & the lungs. As a result, Their less room the rider has for them to expand in to & reduce effective lung capacity. The tidal volume (amount of air your lungs can breathe in) is decreased and overall breathing is adversely affected. This position encourages a rider to ride at a low cadence. Therefore to keep up a decent pace over the course of a ride, the rider has to push a lot harder, relying much more on muscular strength, as opposed to cardiovascular strength & endurance. This is a high cost work zone (low reps, high weight) meaning the recovery for it will take longer as opposed to a normal to high cadence ride (high reps, low weight). All bicycle component companies manufacture their front derailleurs to be at optimal shifting performance on a 73 degree seat tube angled frame. Poor shifting will result from 72 degrees or less seat tube angle, and hence you don't get the most out of your bike ( in terms of shifting performance of your bike ). A well designed bike would have 55/45 % weight distribution. Setback frame would have 60 + / 40% - weight distribution. Due to the higher weight bearing required on the rear wheel, it will wear a lot quicker than a standard setup. 15 ) Rear wheel beaked traction point prematurely, due to relative high lateral load. Rear wheel will slide sideways in high speed cone ring. resulting in a crash. 16 ) abnormal wear of rear tyre, lead to higher maintenance cost. 17 ) rear tyre more likely to puncture, the last thing that you want in a high speed descent. The frame will force you to engage low performance pedaling. No matter how hard you train, you will get nowhere performance wise. You do not improve as a cyclist, and you marginalize yourself as a low performance rider. That why reputable bike manufacturer or custom frame builder will not build a racing frame with excessive amount of setback. It is not a cost concern. ( It won't cost them an extra cent ) It is about your safety. It is a liability concern, customer should sue the manufacturer, if the excessive setback cause them getting hurt and injury. I talking about multi million dollar legal litigation, given that if the end user know what cause the crash. 1. Riders who ride low cadence @ zone 2 or under for short periods of time. One or twice per week. What is the protocol of Sport institutions to determine riding position? A proper bike fit would cost anywhere from 5-6 digits in dollar terms. The “ Set You Back " fit is nothing more than a pseudo-science. Lady city courser, designed for relaxed ( low output ) & short distance urban commuting. Conclusion: The “ Set You Back ” fitting & frame design is one that adapts to a rider’s low cadence pedaling style, however wrong or ineffective it may be. Their fitting client may feel more comfortable as they are in an optimal position for their own style, but does not necessarily mean it is more efficient & good for their health & general well being. If one kept grinding high gear for the next 20 years, I can't imagine the detrimental consequences to their body. A correct cadence ( 80 + rpm ), pedaling & riding technique is a precursor to a proper bike fit. In many cases, rider’s feel immediately more comfortable after being shown the proper riding technique. It is only then that a ‘proper’ bike fit can be done and benefit the rider the most.